I was brainstorming with a friend the other day about her teenage son, who is totally out of control. He’s drinking, he’s smoking pot and may be doing even worse. Because I am not a parent, I couldn’t fault her parenting, but I did think of some different strategies that she could use to deal with him. Drinking: Keep fake alcohol in the refrigerator. Water down the booze and wine. Buy near-beer. Trick him into thinking he is getting drunk. Smoking pot: Steal his weed. This mom in question said she could sniff out his weed in all his “secret” places like nobody’s business. Why shouldn’t she just confiscate it and replace it with oregano so that he will look stupid in front of his friends? Using more serious drugs: Find out who is selling him the drugs. The person is probably not a teenager and may be corrupting him in other ways, if in fact he is using harder drugs. Find the true source of the problem and find out the options. The punishment for dealing drugs to a minor is probably much stiffer in a majority of states than the penalty for a minor using the drugs. I have no idea if any of these strategies will work as I have never had to try them, but I have other ideas, too. Make the punishments tough and enforce them. 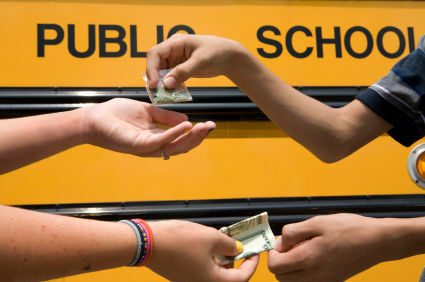 Marijuana is non-addictive, but is definitely not helpful for teenagers who are saying they are doing their homework, but aren’t. Keep him busy. The person I talked to had employed this strategy a bit. My strategy would be to force the teenager to get a job like many other American teenagers do. If he is working at a fast food restaurant, you can easily stop by and make sure he is there. If he is working at his dad’s office, you will definitely know where he is. Do not believe him. Teenagers lie all the time to keep from getting into trouble. They will blame innocent people. Remember that you are smarter than he is by about a million times because his tiny brain is still mush. Get his friends on your side. Many teenagers are strongly anti-drugs. If your teenager has made “new friends,” try to get in contact with his old friends. Reminding him that his “new friends” are not really his friends probably won't work, but it might.